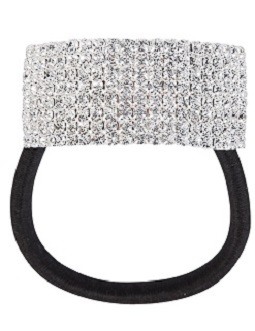 The Rhinestone hair cuff is attached to a heavy duty elastic rope-band ponytail holder. This elastic hair tie does not have any metal crimps, on the band itself, that can pull your hair. Size "2 1/4 x 3/4"
FWO Extras: The approximate size of the Rhinestone Hair cuff is 3/4 inches wide x 2 1/2 inches long.